Advantage Healthcare Systems has helped thousands of patients sufficiently improve their physical capabilities for return-to-work after an injury. The functional, physical, behavioral, and vocational needs of injured workers are addressed by involving all parties who have an interest in a rapid, stable, and safe return-to-work. Much attention is paid to work behaviors, education, and safety. The highly structured, goal-oriented program involves intensive strengthening and conditioning, cardiovascular training, behavioral and psychological counseling, and work simulation that reproduces the physical demands of the job in terms of work heights, weights, postures, and tolerances. Many cases require on-site evaluation of the job. Daily programs typically progress from 4 to 8 hours in length over a 4-week period, with many patients released early after meeting their program goals. If a patient is released to return-to-work in a modified/limited duty fashion, a dove-tailed work hardening program may aid the individual in gaining the ability to return to full-duty status. This dove-tailed program would typically be provided in a 2- to 4-hour sessions, 3 to 5 days a week, in conjunction with the patient’s limited-duty workday. This program helps increase functional capabilities while allowing the patient to return to the working environment. The ultimate goal of this program is to progress the patient to full-duty status. 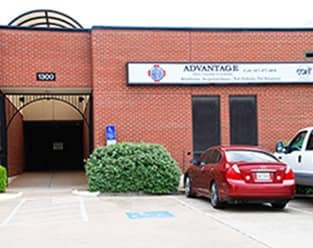 With main locations easily accessible in Dallas, Fort Worth, and San Antonio, we have been serving patients from around the United States as well as internationally. 1102 Solon Place Way, Ste B. © 2019 Advantage Healthcare Systems. All Rights Reserved.